I can’t believe how quickly time has gone since I was in beautiful Vancouver but at least I can relive it by sharing it with you in my blog. One of the things I find most bizarre about Canada is that so many websites look like they were made about 10 years ago and a lot of them may have not even been updated since! Many retailers had websites that would make CAMRA websites over here look polished in comparison (for overseas readers, CAMRA UK websites tend to be shockingly bad). However, unlike in the UK, the beer industry and its aficionados seem to have really got the hang of this internet thing. The Most Awesome Website award (which would see the average What’s Brewing reader have the whole bar condemned for sorcery) would probably go to St Augustine’s Brewpub. Imagine if you could see exactly what beers are on as well as what colour they are and how much is left at a glance before you leave the house. Imagine no more thanks to the Live Beer Menu. As well as on-line, it’s also shown on screens around the bar. group of craft beer lovers who organise and promote craft beer events such as the Hopscotch event held over two nights as part of the Craft Beer Month celebrations and as a warm-up for the Hopscotch festival. The Tweetup event featured 8 Highwood Distilleries Whisky based casks of amazing beers. On each table, along with the beer menu, there was also a list of hashtags and Twitter IDs to enable drinkers to tweet their opinions and shout-outs which were displayed on screens around the bar. There were also competitions where prizes were awarded to the first person to tweet an answer to a question, Pretty clever since as more people tweet, the event starts trending and this means free publicity – sweet! The two nights were held at two different bars which are part of the Donnelly chain (like ‘Spoons but with good food and good beer), Smileys and The Bimini. Of all the beers, the best was easily the Lighthouse Imperial Whiskey Marmalade IPA. The bitter hops totally intensified the Seville orange marmalade to the max. This was closely followed by the Central City Spanish Oak Aged Vanilla Bean Whiskey Stout. Hopefully if they ever bottled it they’d have a think about the name, A superb stout with plenty of coffee bean, it picked up a fair bit of the woodiness from the oak which was offset by delicate vanilla. 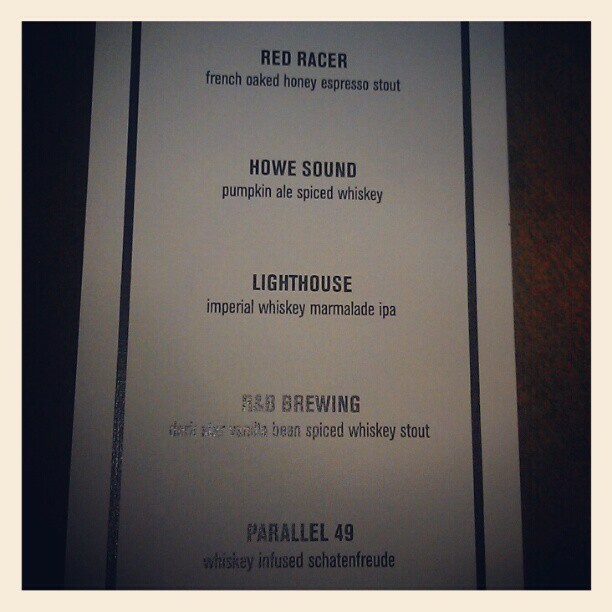 I also loved the Howe Sound Pumpkin Ale Spiced Whiskey. Their original pumpkin was one of my favourites but the warmth of the whiskey and the round woody flavour pushed it over into a new level.